Severe dehydration can result in weakness, shock, disorientation, muscle twitches, irregular heartbeat and coma. Inadequate drinking water, low humidity, high temperatures, poor diet, disease and infection can all contribute to dehydration. Call your veterinarian first thing if you have a dehydrated lizard. Steps to take in lieu of the vet's input include feeding the creature electrolyte or soaking him in it. Don't feed the pet until it's well. Mix pediatric electrolyte beverage with an equal amount of lukewarm sterile water. Fill an eyedropper with the diluted electrolytes. 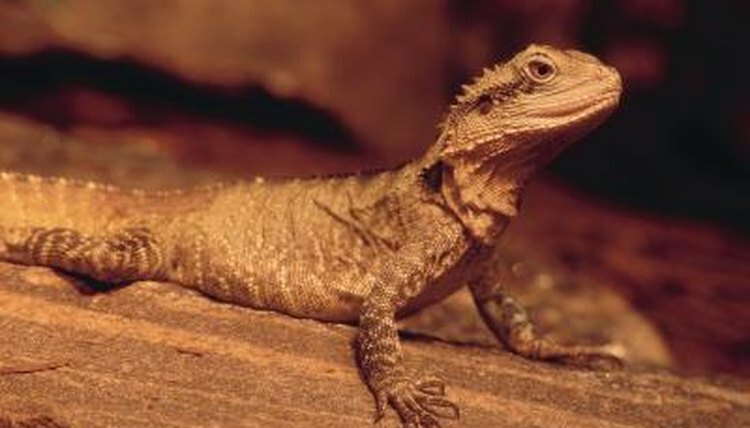 Use the eyedropper to place a drop of the diluted electrolyte on top of the lizard's snout. Watch for him to lick it up. If he does, drip a few drops on his tongue as he's licking. If he doesn't lick at the drop on his snout, you will have to force him to take the liquid or give him a soak instead. Holding the lizard's head steady and level, open his mouth by gently pulling down on his dewlap. This is the loose flap of skin under his chin. Place a few drops of electrolyte solution on the front of his tongue. Gently rub under his throat and on top of his head to help him swallow. Repeat until the creature has ingested the proper amount of fluid. In a saucepan, mix equal parts pediatric electrolyte beverage and sterile water, making enough for use in the plastic container or dishpan. Gently heat the solution to lukewarm. Place the plastic container or dishpan on a folded towel. Fill it with the lukewarm electrolyte solution to a shallow depth that's comfortable for the lizard. Place the lizard in the container and allow him to soak. Remove him from the electrolyte solution before it gets cool. Rinse the solution from the lizard's body with fresh lukewarm water.  Use sterile water for drinking and soaking if you do not have pediatric electrolyte beverage.  Be sure your lizard has the right type of drinking facility. Some lizards drink from a bowl, but others will drink only drips and droplets. ⚠ Force-feeding a dehydrated lizard may cause shock or death because he can't digest food without adequate body fluids. Make sure he is rehydrated before you attempt to feed him. ⚠ Giving too much liquid too quickly is dangerous for a dehydrated lizard. Do not give liquids totaling more than 2 percent of his body weight in a 24-hour period without consulting your veterinarian. ⚠ Do not allow the lizard to get chilled. He cannot keep himself warm while he is dehydrated.